Turatti Model 1411-26 slicer, for cutting wedges in cucumbers for pickle spears, or wedge cutting potatoes, and / or cutting other vegetable and fruit products withOUT pits or stones. Currently configured with (8) 12 inch diameter powered stainless steel blades for cutting (8) wedge slices. Could cut quarters rather than eights, by removing every other blade. Tubular stainless steel frame and base plate, currently configured for 58 inch infeed height and 26 inch discharge height, on adjustable feet. Base frame has a 35.5 inch wide clearance between legs to accomodate placement of a tote beneath the discharge to catch product. 360 degree safety shrouding, with latching access doors for convenient maintenance access. PVC control box with safety interlock, cuts power to the machine if any of the access doors are unlatched / opened. INDUSTRIAL FRENCH FRY CUTTER / CELERY STICK CUTTER, pneumatic, stainless steel, with stand. As of this writing, this CMI carrotstick cutter is in stock at Alard, available for timely shipment. At any given time, Alard inentories thirty (30) to fifty (50) URSCHEL cutting machines in our on-site inventory, available for timely shipment as-is, test run, or completely refurbished, and set up with cutting parts for your application. We generally have machines on hand which have been pre-serviced and are ready for immediate shipment. Alard Equipment sells new and reconditioned industrial metal detection systems, for food processing, food packaging, and other commercial / industrial process applications. We generally stock between 30 and 50 machines, many pre-serviced refurbished and / or new, ready for immediate shipment, in a wide range of sizes and configurations, including conveyorized metal detectors (with conveyor belt), drop-through / gravity metal detectors, pipeline metal detectors, and checkweigher-metal-detector combination units. 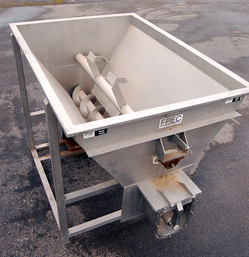 STAINLESS STEEL HOPPER SCREW-FEEDER / LIVE BOTTOM HOPPER, FPEC Accumulation Hopper model SCL-930. 84 inch long by 50 inch wide by 48 inch deep tapered hopper with horizontal shaft anti-bridging paddle agitator, over an 81 inch long horizontal unloading screw. Bottom auger is 12 inches in diameter, with 4 inch high flights on 12 inch centers. Open discharge with U-trough extension. 81 inch infeed height, 33 inch discharge height as configured. All food grade sanitary stainless steel construction, previously used an a USDA inspected meat processing facility. 1.5 HP 3 phase agitator drive, 7.5 HP 3 phase screw/auger drive. 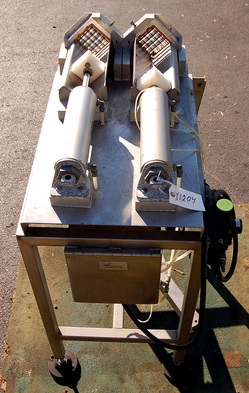 This hopper screw-feeder is in stock at Alard in very good condition. Available for immediate shipment as-is, or can be serviced by our shop prior to shipment, to assure excellent operational condition for timely shipment.